In his research, Cajal’s two tools were the most powerful microscope he could find and one of the oldest art techniques known to mankind: drawing, for which he had great talent. Looking through the lens he saw with such acuity and drew so precisely (freehand) that some of his renderings still appear in text books. And yet he also drew with such delicacy and vivacity that his drawings stand on their own as wonders of graphic expression, both mysterious and familiar. “Axon of Purkinje neurons in the cerebellum of a drowned man,” an ink and pencil drawing. The drawings are at once fairly hard-nosed fact if you know your science. If you don’t they are deep pools of suggestive motifs into which the imagination can dive. Their lines, forms and various textures of stippling, dashes and faint pencil circles would be the envy of any modern artist. That they connect with Surrealist drawing, biomorphic abstraction and exquisite doodling is only the half of it. Born in Navarra, the son of a doctor, Cajal was a rebellious artistic child, with an innate distrust of authority and an obsessive-compulsive proclivity. At 8, according to the catalog, he drew everything around him and then set out to collect everything pertaining to birds. He taught himself photography, making carefully posed self-portraits throughout his life. And he trained as an artist, but his father cajoled him toward medicine by enlisting him to make anatomical drawings as teaching aids. The son then went to medical school and eventually found his calling in researching the extremely refined, nearly invisible workings of the brain. It was an exciting area of study at that time and it perfectly fused his various interests and talents. 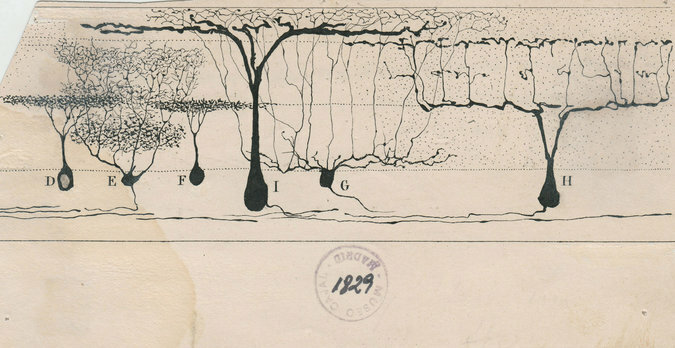 “Glial cells of the cerebral cortex of a child,” a drawing from 1904. This show, the first exhibition of Cajal’s drawings in this country, originated at the University of Minnesota and continues in May to the MIT Museum in Cambridge, Mass. 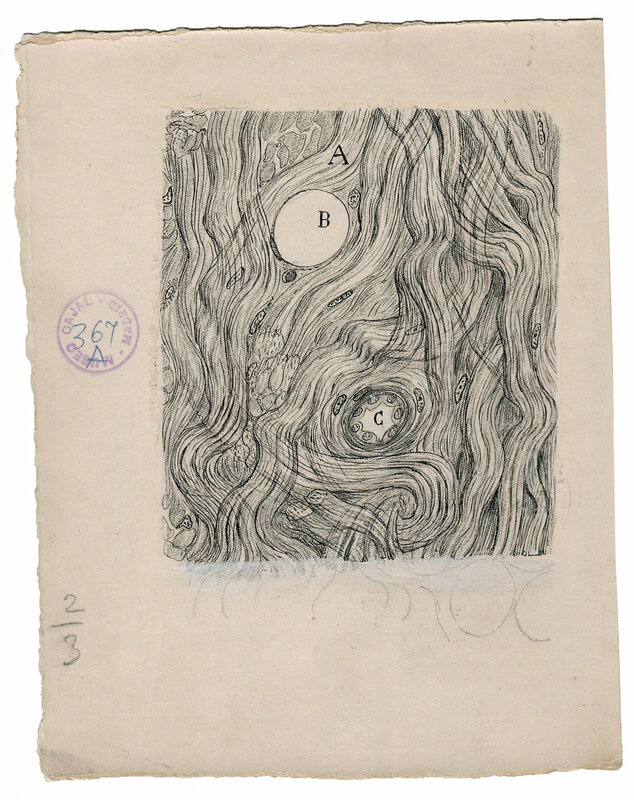 It was selected from the 2,900 or so drawings that Ramón y Cajal made in his lifetime; all come from the Cajal Institute in Madrid, which organized the show with the university’s Weisman Art Museum and three neuroscientists on its faculty — Eric A. Newman, Janet M. Dubinsky and Alfonso Araque. The catalog is an absolute treasure, jargon-free, with excellent reproductions and an illuminating biographical essay by Larry W. Swanson, a neurobiologist and author of “Brain Architecture” (2002). The outliers of the group are Lyndel King, director and chief curator of the Weisman and Eric Himmel, editor in chief at Abrams Books (the catalog’s publisher), who contribute a riveting essay detailing Cajal’s artistic sensibility and working processes. The drawings will elicit stupefied awe from art enthusiasts, who use their brains without knowing how they work, and excited chatter from visiting neuroscience types. . I asked one loquacious, evidently knowledgeable viewer if “gray matter” was a colloquialism or a term of science. I learned that it’s a term of science that became a colloquialism: the brain has gray matter, which contains cells, and also white matter, which is fibrous. The 80 drawings here were made between 1890 and 1933, and are divided into four sections. “Cells of the Brain” presents some of the basics, beginning with pyramidal neurons, and including the pericellular nests that surround them like pointy hats, or Eva Hesse sculpture, and proceeding to the coral-like Purkinje neurons (from the human and pigeon cerebellum). In “Sensory Systems,” you’ll find several of the show’s masterpieces: “Cells in the retina of the eye,” a vertical stack of textures and intersecting lines and shapes, suggests a wall hanging by a very ambitious fiber artist of the 1950s. Drawings for the retina of the lizard and sparrow evoke espaliered trees. Blue ink added to the peninsular forms of “The labyrinth of the inner ear,” renders them solid. And the Wagnerian “Ending of the vestibular nerve” is swept with diagonal streams of lines and rising neurons. “Retina of the lizard,” 1911. “Seeing the Beautiful Brain Today,” a section on contemporary renderings usually in jolting bright colors, presents animations as well as detailed microscopic photographs that are juxtaposed with reproductions of Cajal drawings of the same subject. 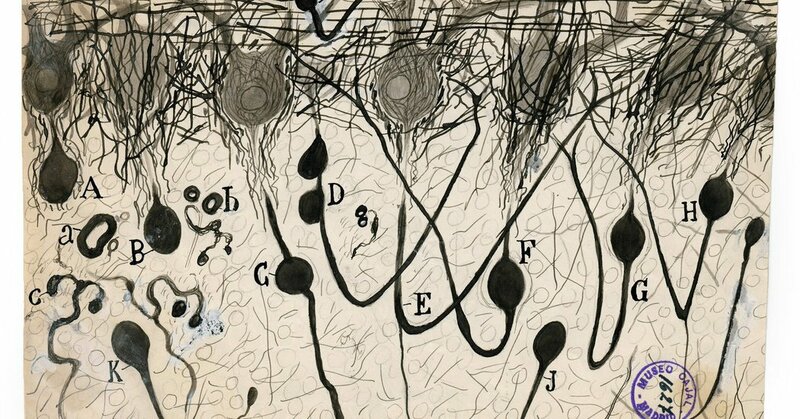 Nothing here compares to Cajal artistically, but the animations have their own kind of wonder and should not be missed. 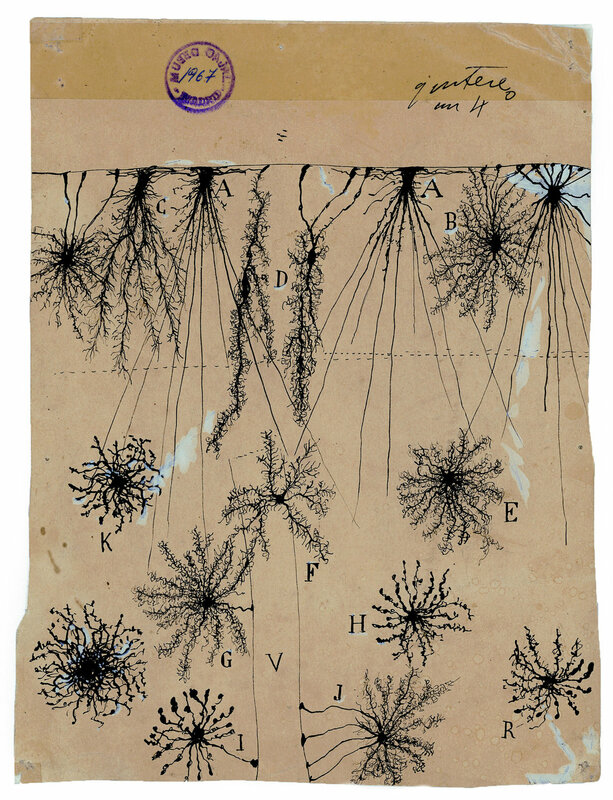 From “The Beautiful Brain: The Drawings of Santiago Ramón y Cajal” at Grey Art Gallery, “Tumor cells of the covering membranes of the brain,” from 1890.